On Sunday’s 20-mile training run I had a lot of time all to myself to think. Two Hours, Twenty Six Minutes and Sixteen Seconds to be exact. I really relish these long runs during Marathon training as when was the last time you had almost two and a half hours all to yourself to ponder life’s great questions? The fact of the matter is that as busy as life can get sometimes, it’s hard to carve out that kind of time all to yourself. Sometimes I think about serious things, like Dom and the hole that was left in the D’Eramo family with his passing in August. What will Christmas be like this year for Val, Sierra and Nico? How about Shirley and Dom, Sr. – his parents. Just last year I was at their house enjoying Shirley’s “Seven Fishes” Christmas Eve dinner surrounded by dozens of D’Eramo’s spanning three generations. Sometimes I think about my own growing family, how Landry has just learned to roll over. She’s not too sure yet what to do once she gets there, but she is still pretty impressed with herself. 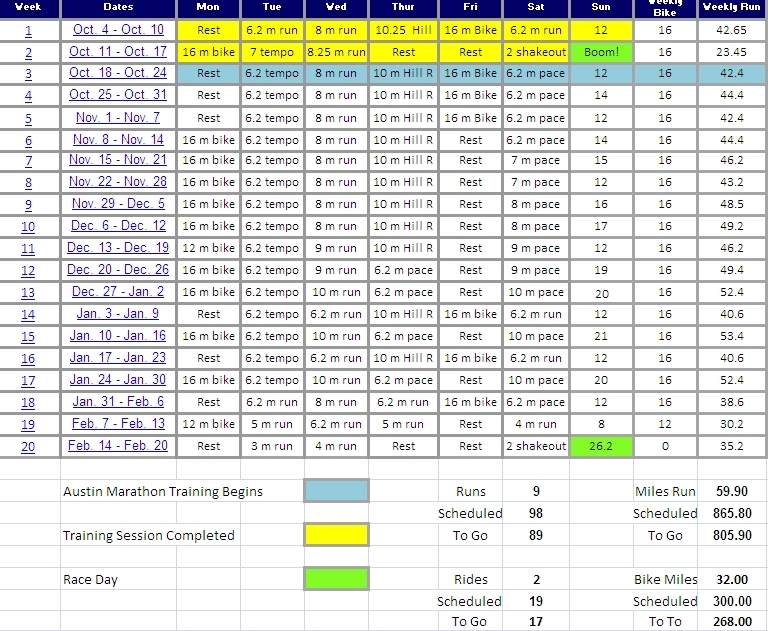 I think about the training miles I’ve run and the miles that still lie ahead to the start of the Austin Marathon. During a specific run I will think about where the approaching hills will be, how my legs feel when I get there, and how much longer before I’m pushing for home, getting ready for a big breakfast. A reward. This past Sunday I started to spend some time, for the first moment really, looking past the Austin Marathon on February 20, 2011. On to the race after “THE RACE”. If I ever had an “A” race on the calendar, Austin is it. I am training harder for this marathon than any race I have ever run. I’m more focused, more determined, more driven than ever. That of course is a bit of a bold statement as this time last year I was about to begin training for the Boston and Pittsburgh Marathons just 13 days apart Running for Dom. But on Sunday my mind started to drift to the second race of this year’s Run for Dom double. Ragnar Del Sol on February 25th. This time just 5 days after a marathon, I will be racing again in another endurance event. Hoping to raise money for Sierra and Nico’s 529 Education Plans. Helping ensure that Dom’s children will be afforded the opportunity to pursue a college education, just as Dom and Val had planned for them long before Dom’s cancer. The Ragnar Relay Series takes place in 15 different locations around the United States each year. Each race is approximately 200 miles long, with teams of distance runners competing against others to complete the course in the shortest amount of time. Our team consists of 12 runners from Austin, Houston, Dallas, St. Louis, Virginia Beach, Cincinnati, Baltimore and Scottsdale, all converging on Wickenbug, Arizona to race all the way to Tempe – covering 202 miles of Arizona Desert. The race is going to be far different from anything I have ever done, as I along with each runner on our team is assigned “legs” of varying distances and difficulties. With 12 runners on the team, each of us will be running 3 of the 36 individual legs as we travel along the 202 mile journey in approximately 24 hours. Our team will be given a starting time in the next few weeks. We will begin taking our first strides onto the course sometime during the late afternoon on Friday, February 25th. On Saturday afternoon roughly 24 hours later, our final runner and two vans full of 11 teammates and drivers will reach the finish line in Tempe, AZ. 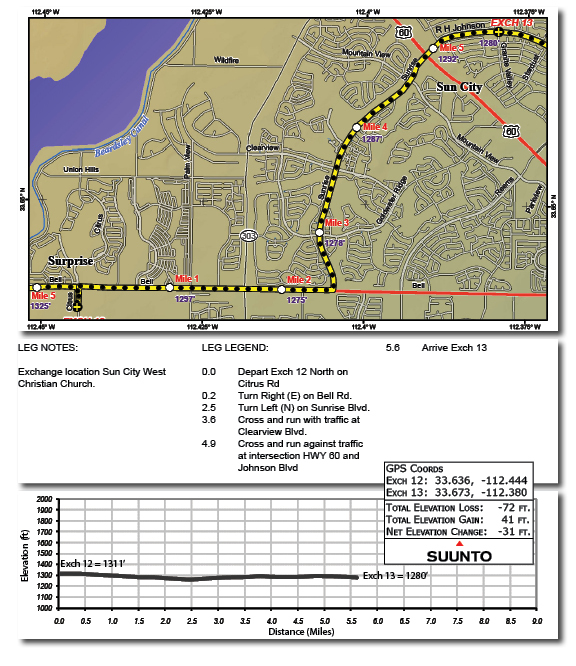 Our team will be divided into two vans, one carrying runners 1 through 6, the other with runners 7 through 12. Runners from van number one will be responsible for running the first 6 legs of the race, while runners in Van two drive out to the 7th Exchange Point to get some rest waiting for us to arrive. At the 7th exchange point, the runners from van number two will take their turn running legs 7,8,9,10, 11 and 12, while our van heads to exchange point 13 and awaits their arrival. 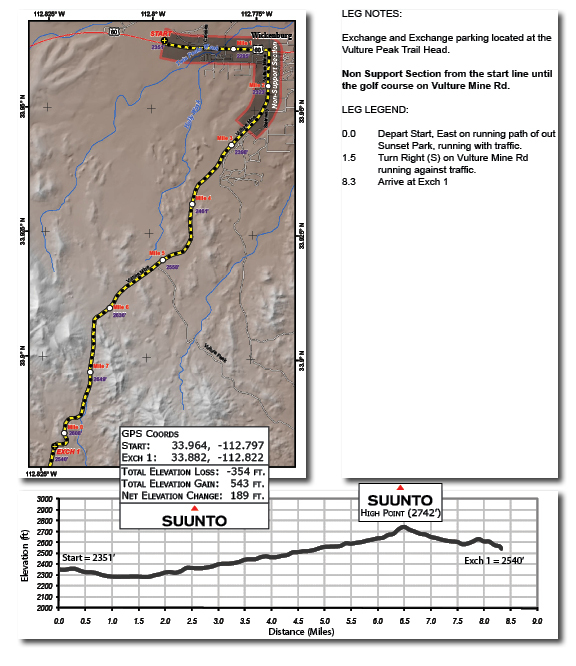 Our team will continue to leapfrog their way through the course through all 36 legs, finally reaching the finish line in Tempe the following afternoon. This means running through the Arizona Desert throughout the night all in the search of Ultra-Marathon Glory. 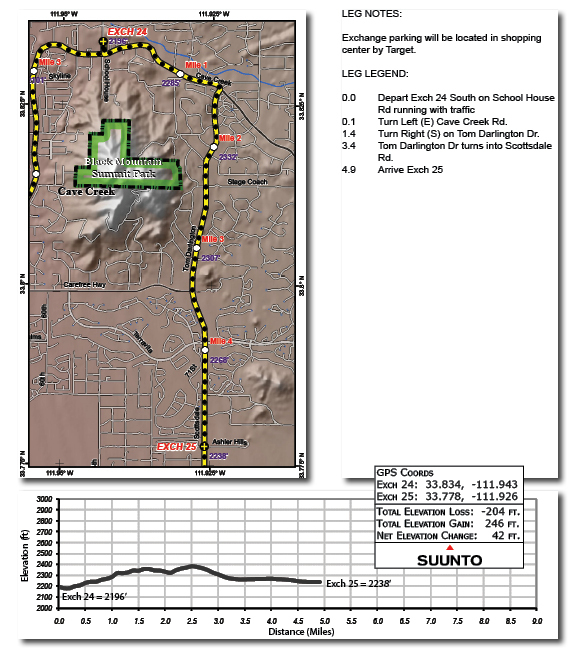 I have been assigned the “leadoff spot”, meaning I will be the first runner to take to the course out of Wickenburg. I will be running legs 1, 13 and 25. When I reach each exchange area I will be handing off to my teammate Kim as she runs legs 2, 14 and 26. She in turn will hand off to my good friend Steve “British Bulldog” Speirs, who will run legs 3, 15 and 27 and so on down the line. Running the anchor leg for our van out of the number 6 spot is my good friend Sean Brown. Many of you may remember Sean from “Sean Runs for Dom” at the Chicago Marathon in October. Sean will be the final runner in our van covering legs 6, 18 and 30. Our team captain Jenny and Kim’s husband Michael will be running out of the number 4 and 5 spots respectively. Teammates Dan, Carol, Eddie, Andrew, Nina and Thomas will run the remaining legs representing our team out of van number 2. Now, running through tough terrain, over all hours of the evening into the wee hours of the morning will make pacing difficult to predict. But by my estimate, after I wrap up the opening 8.3 “Very Hard” miles as described by the folks at Ragnar – I will be running again approximately 11 hours later. Should we start at 4:00 p.m. and my 8 mile run takes me about an hour, my next leg may start at 3:00 a.m., followed by my final leg sometime after lunchtime on Saturday. How are my legs going to hold up having raced the Austin Marathon just 5 days before? Great question. Very similar to the question I had to answer running a second marathon just 13 days after Boston last spring. The good news is that this time I only have to run 18.8 miles, not another 26.2. The bad news is I only have 5 days to prepare after Austin, I will have to run them through all types of temperatures and conditions, at all hours of the day and night dodging Cacti and Coyotes. I don’t know about you, but it sounds like a helluva lot of fun to me. Nobody said this was supposed to be easy, and I’m sure it won’t be, but it will all be well worth it to help pay tribute to Dom and raise money for his children’s education. We still have room on our team for you to join us, I won’t even make you run!